20 cm xiii, 297 p.
Originally published: London: William Heinemann. Every culture rests on a bedrock of folk wisdom handed down through generations. The pronouncements of philosophers are homespun by our grandmothers, and find their way into our common sense: what doesn't kill you makes you stronger. Do unto others as you would have done unto you. Happiness comes from within. But are these 'truths' really true? Today we all seem to prefer to cling to the notion that a little bit more money, love or success will make us truly happy. Are we wrong? 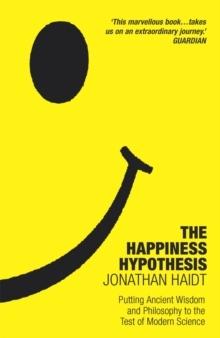 In "The Happiness Hypothesis, psychologist Jonathan Haidt exposes traditional wisdom to the scrutiny of modern science, delivering startling insights. We learn that virtue is often not its own reward, why extroverts really are happier than introverts, and why conscious thought is not as important as we might like to think...Drawing on the rich inspiration of both philosophy and science, "The Happiness Hypothesis" is a remarkable, original and provocative book - ancient wisdom in our time.